On the cover: Eureka High School students from left: Chou Yee Her, Ashlena Dass and Kellie Siler. Photo by Kyana Taillon. HIGH SCHOOL IS SUPPOSED to be the best time of your life, but what about the homework, the hormones, the fights, the zits, the trends, the cliques and gym class? Sure, there are some great times in everyone's teen years, but let's admit it high school is torturous for lots of people. Perhaps it is in our nature to forget the trauma and reminisce instead about the good ol' days that weren't always that great. On the cusp of graduation, five Eureka High seniors reflected on their high school experiences and talked about what they will do in the future. Their impressions were mixed; their post-graduation visions varied; and their career plans were not set in stone, but one thing was fairly constant -- they are not going to miss high school. Jimmy Stivers is primed to give Eureka High School a farewell salute and jump into the disciplined life of a Marine. 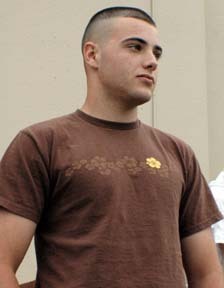 Still two weeks away from graduation, the18-year-old, lifelong Eureka resident already looks the part, sporting a trademark military crew cut and straight, confident posture. He answers questions in short, declarative sentences. He doesn't fidget; he doesn't avert his eyes; his hands stay folded neatly on the table in front of him. This is not to say that he seems uptight or robotic. He's just an assertive teenager who has made up his mind. "I always knew I wanted to join the military and I looked at the Marines as being one of the best," Jimmy said. And in Jimmy's case, no coaxing was required to get him to join. "They're actually the only recruiting office that didn't call me, didn't send me anything in the mail. I just walked in and told them I wanted to be a Marine." Five other students from EHS are joining the Marines. According to the 2004-05 school profile, 4 to 6 percent of EHS students join the military. When Jimmy announced to his family that he was enlisting, his parents and relatives were understandably apprehensive. "None of them wanted me to do it," he said. "Three of them were in Vietnam and they saw a lot of stuff they didn't want me to see. My [great-uncle David] actually threatened to kidnap me and take me to Canada." "It's my life and that's what I wanted to do," he said. "I didn't want to go to college. "There is nothing about school that I ever liked. It's not me; it's not my personality. 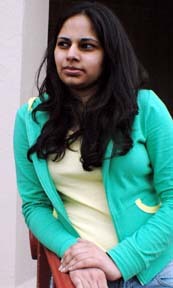 For me, I think college would be a waste of time and money." Now that his family has had some time to get used to the idea, he said that everyone other than his father has come to terms with his decision. "Me and my dad don't see eye to eye on too many things," he said. "We don't really talk about it. I mean, he's proud of me, but I don't really know. We just don't talk too much about it." Jimmy leaves on Aug. 1 for 13 weeks of boot camp at Camp Pendleton in San Diego, followed by another six to eight weeks at the camp's school for future infantry soldiers. In the meantime, he plans to keep exercising to make himself "more physically and mentally ready." For the next two months, he will also be harvesting oysters at Aqua-Rodeo Farms, a job he started a few weeks ago. He said he doesn't envision himself moving back to the North Coast, unless he can work in the Marine Corps recruiting office in Eureka. "That way I would be able to see my family," he said. "Other than that, I don't want to live here." It is obvious that family is important to Ashlena Dass. She said that her parents, who own a motel in Eureka, have been her role models and taught her the importance of pursuing higher education. "I learned what I should do from them," she said. "They come from India so they never really went to college. My dad went to college a little bit but it didn't mean anything when he came to America. "So, I knew that I wanted to get an education because I've seen them work and they struggle. They had to work their way up. They didn't have an opportunity to start at a higher position." And Ashlena, a somewhat reserved, yet poised 18-year-old, has worked beside them in the three years that they have lived in Eureka since moving from Rochester, N.Y. The experience taught her she would rather not pursue a career in business. "I think I want to go into the medical field," she said. Her interest in medicine landed her a $1,000 scholarship from St. Joseph's Hospital, where she'll volunteer until she leaves for the University of California at Davis in September. Her parents are happy for her but will be sad to see her go. "They support my decision, but they wanted me to stay out here because I'm their only daughter," Ashlena said. She has two younger brothers. Where she'll be five years from now is still too far away to speculate upon, but the chances that she will return to live in Eureka are slim, she said. "I plan on living in a lot of different places," she said. "I want to go out of the country. I like the city. I like being where there are a lot of people." Home to only a little more than 28,000 people, Eureka doesn't exactly fit the bill. By comparison, UC Davis alone has 30,000 students. 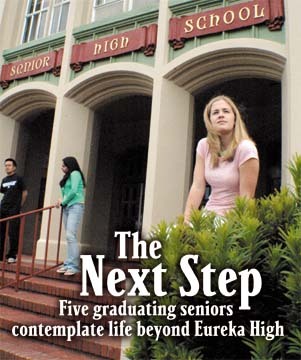 This year Eureka High has 1,650 students; down from 1,950 students six years ago. With so many young people around, does she think she'll spend more time partying than studying? "I haven't really been a partier," she said. "I mainly have parties with my family and my cousins. I would probably go to parties but I wouldn't make it my whole life or more important than my education." When Trent Semas' father was transferred from his job at Costco in Riverside to the Eureka store seven years ago, Trent was not happy. "I was kind of angry because all of my friends were down there," he said. "But when I got here, I realized that I just loved this town and the people here." It's not everyday that you hear a local teenager, or adult for that matter, express their love for Eureka and Eurekans -- it's kind of refreshing, really. And in an era when most 18-year-olds desperately want to get as far away from their parents as possible, Trent, who comes off as ultra-laid back and content, is happy to just be here now. He wants to follow in his dad's footsteps and stay in the area. "What I plan to do is get a job at Costco, and maybe work there for a few years, and then maybe go to [College of the Redwoods]," he said. "Right now I'm just kind of tired of school but I will probably go to CR at some point." So would he like to have a lifestyle similar to his dad's? "Yeah," he said. "I want to have a big house, big family, lots of money." Trent is the second oldest of four kids. A little brother and sister go to school in Cutten, and his older brother works construction in Riverside. He's been back to his hometown to visit, but he's not interested in moving there. "It's gotten a lot bigger than it used to be, a lot more people," he said. "It's really different than Humboldt. I like it here better." When he eventually goes to CR, Trent said he might like to study pottery. His guidance counselor, Monica Rivera, said that Trent's work is "incredible" and that he is currently the pottery teacher's assistant. So where does Trent see himself five years from now? "Probably still working at Costco," he said. In no way does Kellie Siler resemble those hackneyed stereotypes about overachieving teens -- bespectacled, headgear-equipped, pocket protector-clad, pigeon-toed, etc. She's more along the lines of a blonde-haired, blue-eyed, socially capable teen athlete reminiscent of some Disney darling. But considering that she is on her way to Tufts University -- a competitive private college in Boston -- with a full scholarship to study applied mathematics, anyone can see past her Lizzie McGuire-caliber charm to realize that she is a stellar student. But the 18-year-old soccer player, who moved to Eureka from Fortuna at 14, tends not to elaborate upon her scholastic achievements. Probably for modesty's sake, Kellie balked at opportunities to brag, and used vague, indecisive language, presumably to downplay her accomplishments and aspirations. It took a follow-up chat with Eureka High guidance counselor Monica Rivera to learn that Kellie, along with one other student, is the valedictorian of the Class of 2005, which is made up of about 330 graduates. She's so top-notch, Rivera said, that her grade point average is essentially better than perfect -- a 4.3. Extra points for honors courses pushed her past a straight A average. After some prodding, she said that, like Ashlena, she too might like to pursue a job in medicine. "I've toyed with the idea of becoming a doctor, but I don't really know," she said. 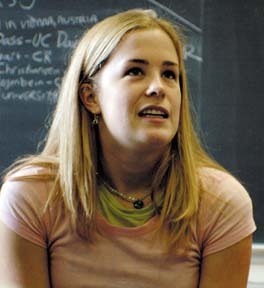 Rather than outlining her goals, Kellie seemed more comfortable talking about the ins and outs of high school. "I'm hoping that in a university setting people won't be putting on a front," she said. "That happens so much here." "Well, girls will be cruel to other girls because of stupid things that are not going to matter in a month. Like, `You gave me a dirty look when you parked your car next to mine.' Things like that. You hear it in the hall. The way they talk about this stuff sounds like it is the most important thing in the world. I think I might have even been that way myself at a point." Any regrets as she's leaving Eureka High? "I wish I would have made more of an effort to be friends with people who I wouldn't automatically be friends with," she said. "When I first came here, anyone who wanted to be my friend was fine because I didn't know anybody. So I was almost automatically put into this group." "The preps, I guess. And I kind of wish I made an effort to think outside of the box I was put into. That is one thing I would advise to younger students." Five years from now she will probably be in graduate school, she said. Beyond that, she couldn't say with much certainty. "I guess I really don't know what I want to do, specifically. My dream is probably to be happy with whatever I'm doing. Probably location-wise, I would like to be in the suburbs of a more metropolitan area. But specifically, I don't know enough about what I want to do." Chou Yee Her came right out and said it. "I dislike a lot of people here," he said. This isn't to say that he is a mean or lonely teen. In fact he can seem downright cheery and funny, but still dissatisfied and frustrated, like an actor with no stage. Chou Yee, who is Hmong, lived in Eureka until kindergarten, then moved with his family to Madison, Wis. His family moved back last year and he enrolled as a Eureka High junior. Learning how to fit in at a new school is never easy, but it was harder for Chou Yee because of the racist mentality of some EHS students, he said. "I would say like, my family name is disgraced," he said. "They pretty much ruined it for me. When I came here, all I heard was bad names about our last name and stuff." EHS has a zero-tolerance policy for hate speech on campus, but that doesn't mean that it never happens. Kellie and Ashlena backed Chou Yee's claim -- racial name-calling happens a lot. The tension is reinforced by segregated atmosphere: preps hang with preps, Christians with Christians, partiers with partiers, and Asians stick with Asians. According to student demographics, 70 percent of students are white, 9.8 percent are American Indian, 7.9 percent are Hispanic or Latino, 6.4 percent are Asian and 3.2 percent are African-American. Chou Yee said he would like to go to the University of Wisconsin at Madison, where he feels more comfortable with the people. "Over there, we're all connected to one another and we take the time to understand one another instead of just judging," he said. He's already been accepted to the UWM. The problem is that tuition is close to $30,000 a year, and his family is already supporting his three older brothers who are in college. His second option, and the one he will most likely pursue, is College of the Redwoods. But as of last week, he still hadn't made a decision. This semester, more than 100 Eureka High students enrolled at CR, almost a third of the graduating class. In-state tuition there costs around $650 a year. Rivera said that 20 to 30 graduates enroll at HSU, which costs around $3,000 a year. 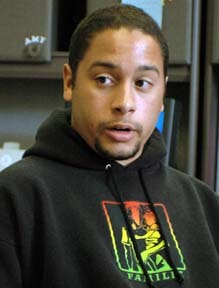 "The reality is that a lot of universities prefer to have kids transfer from community colleges," Monica Rivera said. "Too many kids go straight to a big university and drop out after their first year because it's so overwhelming. "Community college can prepare them for that. We encourage the kids to go to CR because they give preference to local kids." The silver lining to Chou Yee's experience at Eureka High is that he sees local peoples' attitudes beginning to evolve. "What I think is good is that, over here, things are starting to change," he said. "And I feel as if it would be good to stay here and be a part of that and help this place change. I might want to study psychology or counseling or something, just to help, because I feel as if I can help others with what I've been through and all that stuff."